I had been feeling crampy all day. By 11:30 p.m., the contractions I was feeling were becoming more frequent. Just to make sure it was not a false alarm, I got up from bed, did some dishes, took a bath. By 2:30 a.m., I could no longer concentrate on anything but my body and my breathing. I felt warm, calm, and excited that we were going to finally meet this baby. I woke my husband and had him time the contractions while I packed my bag. Contractions were every 2-3 minutes and lasting from 30 to 45 seconds! We called the midwife and decided to meet at the birthing center at 4:00 a.m. The ride to the birthing center was difficult since I was physically limited and could not find a comfortable position. Once we arrived, we had the opportunity to pick our room and when we saw the one with the birthing tub, there was no question. Shortly after we arrived, the midwife checked me and I was between 6 and 7 cm dilated. WOW! The breathing techniques we learned at the couple’s yoga workshop already worked wonders! My husband and I settled in. The beautiful bright room was equipped with a double bed, a bathtub, a separate bathroom and plants. It was comfortable and calming. An environment like that  with no machines, gurneys, iv’s, monitors, etc. - really helped my body and my mind relax. The contractions were getting very intense. I could only get through them by really concentrating on breathing. I would inhale deeply and my exhalation would last twice, maybe even three times as long. I somehow communicated, between contractions, that I wanted to get into the tub. The midwife filled the tub and started preparing for the birth. When I entered the warm water, it enveloped me like a warm blanket. It was a natural “epidural”. I laboured in the water for a while until I felt my membranes rupture. The midwife told me that it would be better for me to deliver out of the water since she thought the baby was big. She wanted to make sure she could help with the delivery but the choice was all up to me. I got out of the tub and got onto the bed. I was on all fours. The midwife checked me again... she told me I was fully dilated and that I could start pushing. There was a small problem... I didn't feel the urge to push. I told her this and she suggested different positions (on my side, on the birthing stool) but I was most comfortable on hands and knees. She then told me that she guarantees I would feel the urge to push if I got back into the tub. Back in I went and as soon as the water hit my belly, the urge was uncontrollable. It was so innate, so primal and I just surrendered to it. My husband told me that I was pushing so hard, my nose turned purple! I got out of the tub at about 8:30. Got back onto the bed and continued pushing. I could feel the baby’s head come down with every push and then back in! I was getting frustrated and unsure of myself. At this point I forgot how to breathe. My husband reminded me and breathed with me, all the while moving from one end of the bed to the other to see what was happening. He then decided to take a short video of the baby’s head while I was trying to push. He came back and played the video for me. I could see our baby’s head and that was motivation enough to finish this job! 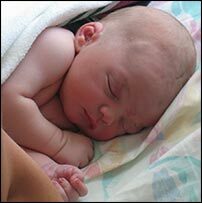 Alexander Dimitri was born at 9:30 a.m. on the 22 September 2004. He weighed in at an even 9 lbs and was 21.5 inches long. I am happy to say that the perineum was intact and baby scored 9 10 10 on the APGAR scale! The midwives brought us a plate of cheese and fruits and left the three of us alone for a couple of hours. Dad, mom and baby went home that same evening and all are doing fine.